Mom has never had ribs. No, really! Never had a rib in her life. Me? I had one rib about six years ago and it was delicious, but I've always been afraid to order them in case they were too overwhelming as a meal. After all, Mom and I aren't really carnivores. 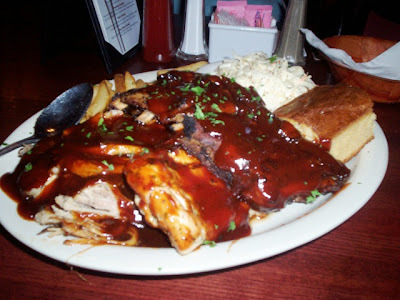 It was only when Mom read the description of the Thames Street BBQ Pit - a platter of ribs, chicken, and pulled pork from Backroad Grille in Bristol - that we decided this may be our best way of trying ribs without actually ordering them. We've driven by the Backroad Grille for a while now and have never stopped in - until now. We pulled into the parking area at 2:30 p.m. Located down a sloping hill, Mom and I always thought that this restaurant looked pretty rustic from the outside. Once inside, we found it a little fancier than we had expected. After a gentleman noticed us standing at the hostess station, he grabbed two menus and showed us to the dining room. Mom and I asked for a table (they have booths, too), so he brought us to one by the wall which provided me with a great shot of the beautiful dining room. It reminded us of a high-end lodge with the exposed rafters and natural wood all around. The gentleman told us that our waiter, Nicholas, would be with us in a few minutes. 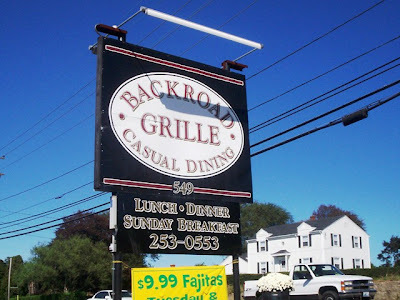 Although this gave Mom and I plenty of time to peruse the menu, we already knew what we were getting thanks to the Backroad Grille's online menu. Our waiter, Nicholas, arrived to our table to take our drink order. We chose two Diet Pepsis ($2.25 each), which were quickly brought out. Nicholas noticed that Mom and I were done looking at the menu, so he asked us if we were ready to order - and we were. We decided to split two entrees - a traditional Caesar salad ($7.95) and the Thames Street BBQ Pit ($17.95). 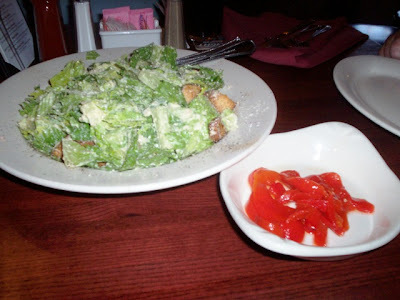 Since the Caesar salad comes with roasted red peppers, which I love and Mom doesn't, Mom asked for the peppers to be brought out on the side. At first there was a little confusion on whether or not we would like the salad to be brought out first, or with our barbecue plate, but Mom and Nicholas worked it out and we decided to have our salad first. We had only been waiting a few minutes before Nicholas brought our gigantic salad to the table. As requested, the roasted red peppers arrived in a separate bowl, and because we were splitting the salad, Nicholas brought out two extra plates. Both Mom and I were surprised at how big the salad was, especially since it is really a meal for one. I grabbed the bowl of peppers and tossed them onto my plate. I just love how their traditional Caesar comes with peppers! The salad was an excellent starter. The Romaine lettuce was cool and crisp, the fresh cheese was lightly sprinkled throughout, and the croutons were crunchy and buttery. We both agreed that the croutons tasted a little like popcorn, perhaps because of the oil they were cooked in. Also, the homemade Caesar dressing was tart and tasty, and of course, I ate every red pepper that came to the table. After Nicholas cleared away our empty salad plates, a few minutes passed before he brought out the main attraction - the Thames Street BBQ Pit. Named for the waterside street in Bristol (there's also a Thames Street in Newport), this meal was enormous! Mom and I couldn't believe that this meal was for ONE person. Like the salad, thank God we were sharing this plate. Backroad Grille certainly doesn't skimp on portion size. After we split everything up - the cornbread, the half rack of ribs, the pulled pork, and the chicken - Mom handed me the cole slaw as I'm the only one that likes it. Fries also came with this meal, but we left them on the platter to soak up some of the delicious barbecue sauce. Mom very timidly lifted her serving of ribs to her plate, and was amazed when the bones actually fell right out and she was left holding the meat. She very carefully started cutting the meat with her fork (no knife needed here) and was pleasantly surprised at how good they were. The meat couldn't have been more moist and tender, and the sauce they were cooked in was sweetly tangy. Unfortunately, these will be the ribs that Mom will judge all others by, so they better live up to it! 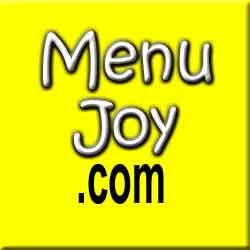 The pulled pork and chicken were cooked in the same sauce, and were also very moist and lean. All of the meats were very easy to pull apart because of how tender they were (except the chicken breast, which was a little firmer because it was a solid piece). The fries were very crisp and potatoey, although we didn't pay them much attention because we were obsessed with our trio of meats. The cole slaw was fresh and cool, and the cornbread was delightfully moist (unusual for a dry, crumbly type bread). No butter was needed! It was a fantastically filling meal. We certainly got our fill of protein! We left $40 on the table for Nicholas, which included a 20% tip. 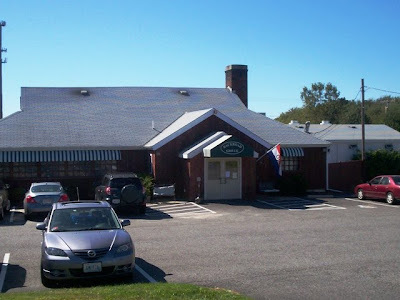 Before heading to Seekonk, MA, to see The Informant!, we decided to use the restroom. We were both thrilled at the potent smell of cinnamon in the ladies' room, and the non-potent smell of anything else. The bathroom was very clean and organized. As we were leaving, we noticed some guests from a baby shower heading outside for a smoke. 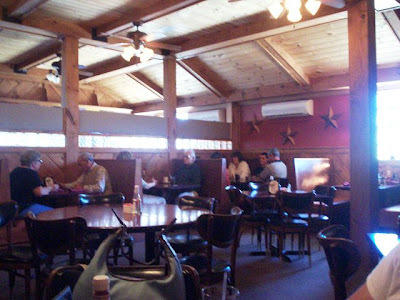 I'd love to see what some of the other rooms at the Backroad Grille look like. It really is beautiful and seems like a great place to hold an event. Mom has officially eaten ribs, and now she's hooked. She's already talking about her next meal of pulled pork and ribs, and hopefully we'll be having it at Backroad Grille. Who knew that a little town like Bristol could serve up delicious barbecue? We can't wait to go back. Backroad Grille is open from 11 a.m. to 9 p.m. Tuesday and Wednesday, 11 a.m. to 10 p.m. Thursday through Saturday, and 8 a.m. to 8 p.m. on Sunday. Breakfast is served on Sunday from 8 a.m. to noon, and lunch and dinner are served from noon to 8 p.m. Backroad Grille is closed on Monday. PS - Since the breakfast menu isn't online, and since we nabbed a copy of it on our way into the dining room, here is some of what you could have: Black Angus strip steak and eggs ($10.95), breakfast sandwiches ($4.25-4.75), pancakes ($3.25-4.75), Belgian waffle ($4.95), the Backroad wrap (eggs, peppers, onions, salsa, and cheddar cheese in a tomato basil wrap with sour cream for $6.95), omelets ($5.25 for cheese to $8.95 for seafood with shrimp, scallops, crab meat, and lobster Newburg sauce), French toast ($5.95), and assorted specials and side orders. The priciest thing on the breakfast menu is the steak and eggs, so be sure to stop by and have a fabulous breakfast for not-a-lot of money.